In this teaser for our next issue on Empowerment, our two politics editors go head-to-head on the question of the Gilets Jaunes: should they be empowered, or tossed aside? In November 2018, a group of French people did what we do best: complain. Ironically, for a movement reluctant to modernity and globalisation, it blew up thanks to Facebook. I’m not sure it would have been as successful by post. The Gilets Jaunes often say they represent the people. But who are the people? And how can they claim they are speaking for them? To be fair, “Gilets Jaunes” is a term encompassing mostly people from the extreme right and the extreme left, who seemed to have found consensus only to destroy the public infrastructure we all pay for. It is true that at the start at the movement, most of the French seemed to agree with the Gilets Jaunes. A lot of people are upset, tired, and feel the president is an elitist technocrat who does not listen to them. But even after getting concessions from the government, the Gilets Jaunes continued for no apparent reason. Or maybe one: getting Emmanuel Macron out. The support for the movement decreased in response. Shops are closing because violent protests every Saturday scare customers away. It is not the multinationals that are suffering from this, but the “people”, the small shop owners the Gilets Jaunes claim to represent. Les Gilets Jaunes, in many ways, have already been empowered. The tax on fuel has been scrapped, in prospect. The movement also achieved some tax relief and triggered a national two-month-long people’s consultation to hear French people’s concerns and act on them. The problem is: The Gilets Jaunes do not know what they want anymore. Some want anarchy, some want Marine Le Pen, some want Jean-Luc Mélenchon. But the truth is, they represent a minority among French people. 60 million people voted for a parliament and a president. It is not 30.000 protesters on the streets every Saturday that should be empowered to change this. Democracy comes from the greek δεμος (people) and κρατος (power): or the people’s rule. The Gilets Jaunes are part of the people, but they are not the majority. The tyranny of the minority is not how a democracy works. While I agree some social classes of French society have been forgotten by the fairly liberal policies of Macron, they should not have the power to overturn it. They are not the majority. A lot of former Gilets Jaunes retired in response to Macron’s concessions. Most of the remaining ones are extremists of all sorts, who say they want to storm the Élysée president Palace, like the infamous Eric Drouet. Protests are violent, and people are demonising police forces that are frankly doing their best. Ironically, the police forces are often of the social class the Gilets Jaunes say they represent. Yes, some mistakes have been made. But violence attracts violence and vice-versa. The State has a duty to keep order. This is not the French Revolution of 1789. A lot of Gilets Jaunes are still marching because it gives a meaning to their formerly bland lives. In a way, they have been empowered. Unemployed, retired people feel they have found a purpose by blaming Macron and sitting on roundabouts every day. Sadly, it is often a launchpad for political extremism. Mélenchon and Le Pen, who endorse the movement, are bourgeois politicians who have been here for decades: the very kind the Gilets Jaunes claim to hate. Emmanuel Macron has seen more of the working life than they have. The very existence of the Gilets Jaunes empowers these extremist career politicians, but they should not be empowered furthermore. Most French people are not Gilets Jaunes, and we believe in something else. Yes, the suffering of the lower classes in today’s France is real, and should be addressed. We are nevertheless one of the more generous countries in the world to the disadvantaged. We cannot give more help to people and decrease taxes in the meantime. The State is not a conspiracy trying to hide money from its people. The divergent ideologies of “Gilets Jaunes” are not the same as that of the whole French population. While it is rightfully known that protesting is the strength and pride of the French, it is the whole nation that should be empowered through democratic institutions; not a noisy minority. The two-month public consultation that started recently is a major democratic moment. Despite some Gilets Jaunes refusing to, all should participate. Anger only leads to anger. France does not need another terror. Sometimes, when I feel like making poor life choices, I check Twitter. A hive of identity politics, people shouting at each other, and dangerously unoriginal memes – but for better or for worse, it’s the best way for a journalist to get exposure. In any case, one of the worst things I saw on Twitter last year was an “unofficial” list of Gilets Jaunes demands, which included cutting immigration in France, setting the top rate of tax at 25%, and advocating for “Frexit”. That all sounds a bit oddball. 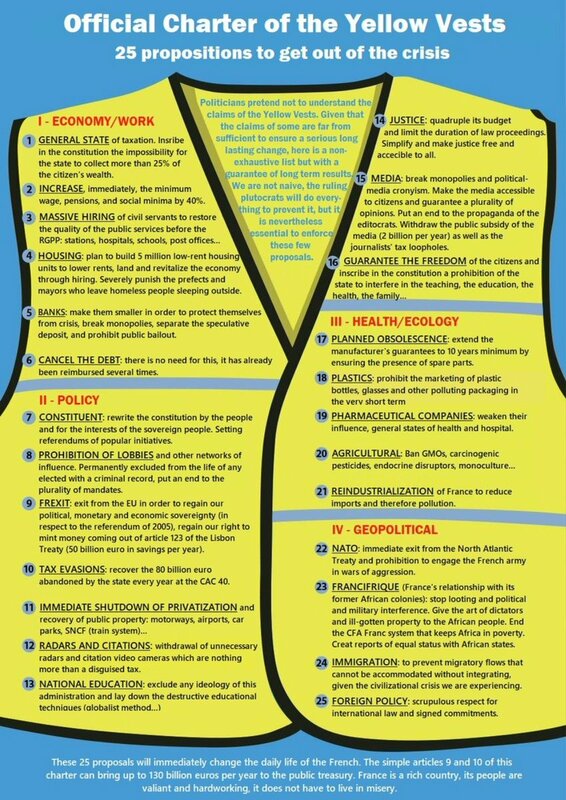 Thankfully, the fact of the matter is that there’s no proof Gilet Jaunes has a single policy platform. It can’t, because it isn’t a cohesive, unified movement. That is its greatest strength; it’s not easily prone to being co-opted by one group within it. However, it’s also its greatest weakness, making it hard for Gilets Jaunes to spell out their demands, beyond “scrap the fuel tax increase” and “get rid of Emmanuel Macron”. Now, those demands, it could be argued, are salient enough. A broad spectrum of disenfranchised political actors who wish to see the status quo put down continue to protest in the hopes of achieving them, anyway. The widespread and pervasive nature of Gilets Jaunes protests is indicative of a resentment that is not necessarily limited by class or other social factors. The anger is palpable and all encompassing. It’s true, then, that there have been fringe acts of violence, but those acts of violence are not contained to the protestors; police have been seen throwing tear gas into peaceful crowds for the sake of causing disruption. Moreover, recent polling indicates that French people are still more or less sympathetic to the cause of Gilets Jaunes. And even if they weren’t, they certainly were at the beginning, with up to 72% supporting their actions back in December. The fact that the French people are getting tired of their mutual insecurity does not prove that the original demands of the Gilets Jaunes didn’t have a broad level of support, because they clearly did. There’s a certain tolerance for a Saturday protest when the cause of that protest is so fundamental and amenable to the national mood; the fact that protests have gone on for 9 weeks is alone testament to the people’s tolerance for Gilet Jaunes’ message. But whose message is it? Some claim that the Gilets Jaunes have galvanised the popularity of the Front National, but this is a straw man; while their polling has increased, La France Insoumise remains ahead, while their leader, Jean-Luc Melenchon, is prepared to express a “fascination” with the movement, which is more than the tacit endorsement Marine Le Pen was forced to rescind. If there is a party that can take advantage of Gilet Jaunes, it is not the populist right, but the populist left. If a political party is likely to engage in any sort of “vanguardism” with the Gilets Jaunes, it will not be one that defends exactly the same established interests that led to the imposition of a fuel tax in the first place. To back an increase in the fuel tax is to defend the idea that it is consumers’ responsibility to cut back in order to solve climate change, while 100 companies alone can be held accountable for 71% of CO₂ emissions. Macron’s decision to travel around France for the sake of public consultation is a façade to bolster his dire approval ratings; if he really wants to consult the public, he should put his leadership on the line and hold an election. I think it would be good if La France Insoumise won out from the actions of the Gilet Jaunes; their pervasive dissatisfaction is a chance to show traditional politics how things can be done when people speak truth to power. We could finally see what a popular, modern, intersectional politics of the left – like Syriza without the debt, or Corbyn without the allotments – can do when it gets a chance. I am not defending the Gilets Jaunes on the basis that they are a perfect social movement, nor do I think the aims of everyone that marches in a yellow vest are necessarily noble. However, I do believe that in order to make even a modicum of meaningful change in a country like France, it is necessary to grab a hold of the spark Gilets Jaunes presents us with, before their fire burns out. A movement with momentum is a glorious thing, and it only comes around every once in a while. I don’t hate Emmanuel Macron, I don’t love tax-free petrol, I don’t even love the Gilets Jaunes. But to stand by and watch their movement wither away, when a party like La France Insoumise could be grabbing it by the horns and driving its fervour to the heart of government? That would be a travesty. If only it were so easy; plus ça change. The fact that the Gilet Jaunes now have their own party might speak to their dislike for establishment politicians, but Le Pen and Melenchon are sideshows in this regard. Macron will always be the number one target, the pièce de résistance – in more ways than one.